The Four Leaf Clover Club is a women’s group which meets on the first Wednesday of the month, from 1:30 to 3:30 PM, for devotions, refreshments, fellowship, and programming. In June, the members enjoy a luncheon before taking the summer off, and in December they have a Christmas party. Group members pay $3 monthly dues. Four Leaf Clover Club together again. Ladies gathered around a friend at a long feast table. 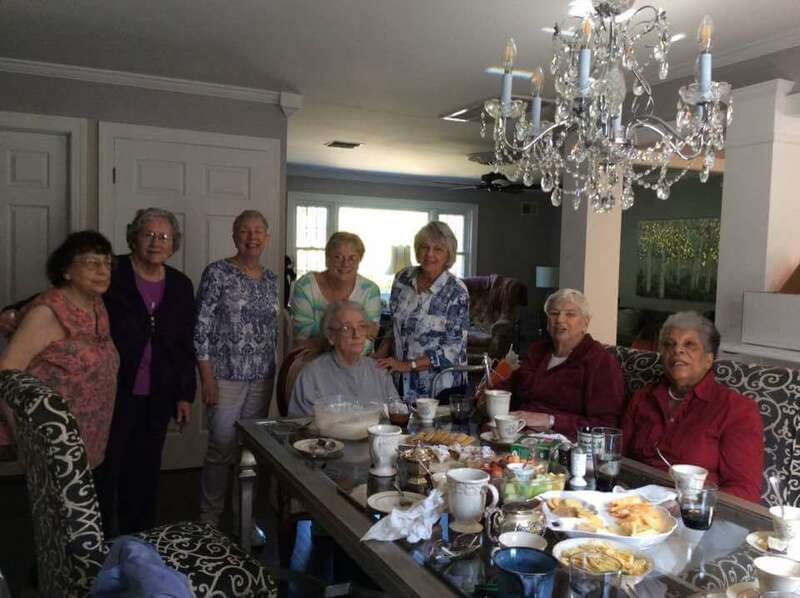 A lovely visit by the Castleton Hill Moravian Church Four Leaf Clover Club with our member Audrey Berge who now lives in Toms River, NJ. Audrey was the heart and soul of our club and we miss her so much – so we traveled down the parkway for a delicious luncheon and visit. Thanks to her daughter Kim for lunch and hospitality. We had a beautiful day!